I have decided that choosing a favorite book is almost as excruciating as choosing your favorite child. I start out optimistic with this warm glow, remembering magical moments spent in a book. I choose some ludicrous title like "Top Ten Reads of 2009"--neat, clean, to the point. Then I compile the initial list. I give myself permission to be indulgent knowing I can always edit out the peripheral titles later. My initial list has more than 20 entries....out of 50. Not bad. No problem. I'll just whittle. I ask the first book to tell me why it belongs on my list. It looks up at me with those big puppy dog eyes and begins... It reminds me of spirited discussions it provoked, or of magical places to which we traveled together. Sometimes it doesn't say anything, it just looks at me with that knowing look and I remember what it was like to be caught up in the rapture of its pages. It smiles, convinced that it's position on the list is secure. I decide to revisit reviews I wrote about some of the books. Surely this will help. I read excerpts from the book and feel like a traitor for even thinking about removing a book filled with such profound wisdom. I apologize and promise I will make a place for it. In truth, not all the books I have read this year are masterpieces. But, because I have rather rigorous admission standards for the books to which I give my time, most are pretty stellar. I finally manage to carve the list down to 16, though I have to hold my breath a couple of times as I click the delete button. I tell myself that top ten lists are over-rated. And I promise to keep my commentary brief. Here are the standouts that made the cut (in no particular order). I recommend each without reservation. The Wave in the Mind: Talks and Essays on the Writer, the Reader and the Imagination I was delighted to find this collection of essays written by Ursula K. LeGuin, author of the fantastic and compelling A Wizard of Earthsea. Her writing is incisive, clever and profound as she treats a variety of intriguing topics. I was especially captivated by her essays on the craft of writing. That Hideous Strength This third installment in C.S. Lewis' space trilogy is quite different from the first two. But, like all of Lewis' fiction, it delivers a riveting story within which are woven, probing, sometimes disturbing, truths of profound import. Windows of the Soul A celebration of transcendence, beauty and communion. More thoughts HERE. Born to Run A riveting narrative AND revolutionary/ancient wisdom on the art, the passion, and the life of running. My review of the book has been, by far, my most Google referred post this year. You can read it HERE. A Million Miles in a Thousand Years Story: A character who wants something and overcomes conflict to get it. Donald Miller will get inside your head with this book. He will challenge the status quo. And he just might provoke you to dream more audaciously than you ever thought possible. You can read my full review HERE. The Seven Storey Mountain Thomas Merton has become a beloved companion over the past couple of years. I first encountered him in a Book of Hours compiled of his writings. The Seven Storey Mountain tells the compelling story of his early years. It begins with his childhood in Europe, the son of Bohemian artist/vagabond/dreamer types, and concludes with his entrance into the Trappist Monastery at Gethsemani. Laced through all are his beautiful reflections on how God pursued him, though he was for so long largely unaware. I have just procured The Intimate Merton: His Life From His Journals which basically picks up where this book left off. I plan to take it with me on my retreat at Gethsemani next month. A Wrinkle in Time, A Wind in the Door, A Swiftly Tilting Planet Yes, I know this is cheating, but they are a family, and you really should read all three, so I am counting them as one. My blog. I can do that. :) These are brilliantly and beautifully written. There are profound concepts, both scientific and sacred, woven throughout these artfully crafted stories. Madeleine L'Engle insisted on addressing difficult topics and using sophisticated vocabulary, mathematics and science in her books even though they were primarily marketed to children/young adults. She contended that the flexible minds of children could more easily accommodate these challenging concepts. Perhaps she was right. Give yourself, and your children, the gift of these marvelous books. You will be glad you did. Eat, Pray, Love This book really stretched and challenged me more than I expected it to. It is raw, honest, heavy, funny, irreverent yet deeply reverent. It speaks to the most basic, essential parts of who we are as humans and how we try to make sense of it. Though Gilbert and I do not always arrive at the same place, we have shared many pieces of the journey. So Beautiful: Divine Design for Life and the Church Herein Leonard Sweet combines the wisdom of the ancients, the most original thoughts of the current generation, and his own insights to paint a winsome picture of who The Church can and must be. More thoughts HERE. The Red Tent I know they were real people. But sometimes it is difficult to remember this as I read the Biblical narrative. This book helped me. It helped me to imagine what it might have been like to grow up as a woman in the household of Jacob (and his two wives, two concubines...). Reality television circa 1900BC. Coming to understand customs and traditions of the time breathed new life and depth into stories I have known since childhood. The Problem of Pain "I am not arguing that pain is not painful. Pain hurts. I am only trying to show that the old Christian doctrine that being made perfect through suffering is not incredible. To prove it palatable is beyond my design." C.S. Lewis once again opens a window on the unsolvable, the inconceivable. He gently shows us the mind of Christ as regards one of the most difficult and disturbing of subjects. Great Lent: Journey to Pascha I am sure my first Orthodox experience of Lent and Pascha would have been memorable without this book, but the depth and richness it brought to the experience is incalculable. Father Alexander Schmemann has been a wise and gracious guide to me through his writings. I know I will read this one again and again. People of the Book: A Novel Pulitzer prize winning author, Geraldine Brooks, builds a spell-binding novel around the elaborately illumined Sarajevo Haggadah. Book restorer Hannah Heath wonders about the history of the book. Each time she discovers a clue; an insect wing, a wine stain, salt crystals, a white hair; we are marvelously flung back in time to meet the characters who created, treasured, suffered for, and protected this extraordinary work of art and faith. And, before it is over, Hannah will have made her own contribution and become one of the "people of the book". Time travel at its most eloquent. Founding Brothers: The Revolutionary Generation Whether or not you hold a providential view of American History; whether or not you are willing to accord demi-god status to the founders of the republic; you would probably agree that this nation was conceived by a rather extraordinary generation. But what would it have been like to be inside the process? To hear the secret conversations and experience the inner wranglings? To see the insecurity and recrimination? Joseph Ellis takes us there in this Pulitzer prize winning epic. He builds the work around six pivotal events, and helps us see everything from the short view and the long view, which are sometimes startlingly at odds. Christ is Born! Glorify Him!!! He who holds creation in the hollow of His hand. He who in His being cannot be handled. who of old established the heavens in the beginning. He who rained Manna on the People in the desert. the Son of the Virgin. An accumulation of all that has gone before. The promise of all that is to come. Enjoy the lingering fragrance...but do not grasp. Do not greedily try to cling. For there are other moments. *Thanks to our dear friend, Angela Davis, for "capturing a moment" for our family. Never will we be as we are now. And I wish always to remember, even as I walk in expectation. You can click HERE to see the rest of the photos taken that day. The password is kelso. Angela is an artist, and did a brilliant job of portraying the essence of who we are...in this moment. Bethlehem Down as recorded by Sting in If On a Winter's Night. runs in my past, and dreaming of marathons to come. the freshly scrubbed cobblestone streets of Venice. of the Circus Maximus in Rome. Anglais in Nice, France, so beloved by Matisse and his cohorts. a right of passage. Whether I will ever be able to qualify is a big unknown. But I am not willing to surrender the dream just yet. I want to run across the Bixby Bridge (above). more? Runner's World winner for "Most Scenic". wine and cheese about 21 miles in. Palace. Wow!! Currently rated the number 1 marathon in the world. The Great Wall Marathon: China. Ancient structure. About a million steps. Love poetry. Sensual, to be sure. But, Who is the Beloved? Are you comfortable with this? If not, do you wish you were? What does your comfort or discomfort say about you and how you relate to the Beloved? Is there a place in you for longing? for reveling in the Presence? What has this to do with Incarnation? What has this to do with you? Nobility of thought or behavior; magnanimity. What compels us to be generous with our "intellectual property"? Perhaps we are grateful for all that we have received. Perhaps we understand that we steward knowledge and discoveries; we do not own them. Or, perhaps we appreciate the fact that adding our own unique contribution to the human conversation feeds the synergy that spawns new ideas, new dreams, new solutions. Whatever the reason, an act of liberal creative generosity has made available to you and me a most compelling resource. Seth Godin invited a few friends to contribute short, potent, precise essays to a new eBook entitled What Matters Now. Some of the contributors were writers and thinkers I already knew I loved, but many are new and wonderful discoveries. Outstanding innovators in diverse and fascinating fields write about their passion. And they all did it for free. Generosity. You can view the eBook in Scribd above, or download it HERE. 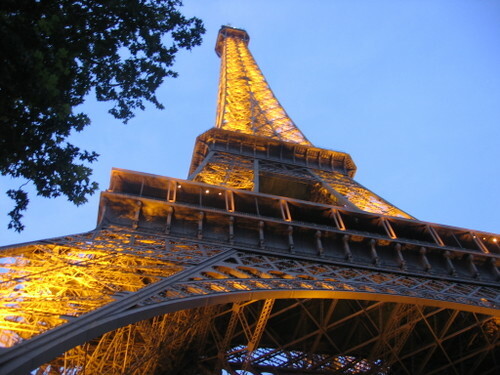 My fascination with the langue française began five years ago when we were planning to make our first trip to Paris. Determined not to be one of those arrogant Americans who expects the whole world to speak English, I learned enough "survival French" to at least begin a conversation, ask directions, make simple purchases and, above all, be polite. I have continued to study the language because I love it. I love it for the beauty, the romance, and the fact that it helps me hear words differently. For instance, when I first encountered the phrase that means "I'm sorry"--"Je suis désolé", it rolled around in my head for days. Desolate. It's the same word. "I am desolate." I suppose "I'm sorry" is used so flippantly sometimes it has lost something of its potency. And perhaps "Je suis désolé" sounds as trite to a native speaker. But for me, it brought new vitality to language and reminded me why I so love words. Just this morning I was introduced to a fabulous, FREE foreign language resource provided by the BBC. I got lost in there for a couple of hours. It is fabulous!! Videos, games, grammar lessons, vocabulary, recipes, holiday traditions, even a very helpful and entertaining introduction to "street French". One of my favorite aspects is that beautiful French scenery and cultural conversation are key components of the teaching. Such a practical and delightful way to learn language and culture! By the way, French is only one of eight featured languages. There is a placement survey in each to help you find the appropriate starting level. Additionally, there are basic survival phrases in 36 languages. Whether you are a student of languages or would just like to flirt with the possibility, I invite you to pay them a visit. Only one holiday album have I downloaded this season. It is enough. Musically rich and elegant, each selection fascinates and delights with its own mystique. Drawn primarily from old ballads, carols, and lullabies of Gaelic and folk origin, these are not likely to be terribly familiar. How perfectly wonderful to encounter lyrics of devastating grace wrapped in earnest, well-seasoned melodies! Of course, it doesn't hurt that the principal vocalist is Sting. How is it that a voice that seems to come from so deep inside has the power to penetrate into one's very soul? And the harmonies! Wow! I confess: I am a singalong girl. These songs invite me. In fact, they fairly dance over, grab me by the hand, and draw me up near the fire to join the circle of song. And they are beautiful madrigal melodies made for lines that weave in and out creating delightful webs of sound. The arranging and instrumentation are positively delicious. Each instrument sings with emotion and pathos. There is no separation between artist and medium. All acoustic. All traditional instruments; earthy and organic. For this exploration of the themes and emotions of winter Sting is joined by friend and long time colleague, guitarist Dominic Miller - and an ensemble of three remarkable musicians from Northern England and Scotland: Kathryn Tickell (fiddle and Northumbrian pipes) Julian Sutton (melodian) and Mary MacMaster (metal string Scottish harp). Additional guest artists include Vincent Ségal (cello), Daniel Hope (violin), Chris Botti (trumpet), Ibrahim Maalouf (trumpet), Stile Antico (vocal ensemble), Cyro Baptista (percussion), Bijan Chemirani (percussion) and the Webb Sisters (vocals). Together they've created an album with a wonderful, warm, and unique ensemble sound - an acoustic meditation on winter. There are tunes that have me dancing round my kitchen, like the old begging song Soul Cake. Christmas at Sea makes me cold. Kelsey and I agreed that this acoustic, rubato version of the Sting classic Hounds of Winter is even better than the original. And there are sweet, sacred meditations that pierce my heart like There is No Rose of Such Virtue, Gabriel's Message, and Bethlehem Down. But the one that had me crying like a baby this morning at the gym was the innocuous sounding "Cherry Tree Carol". Do not be deceived. I was picturing the scene in my head as the words poured over me. I saw the cherry tree bend its branches as the Father of the baby provided... And, I was undone. "Joseph, gather me some cherries for I am with child"
"Oh Joseph, gather me some cherries for I am with child "
"Oh, let the father of the baby gather cherries for you"
Crying, "Lord, have mercy for what I have done"
Thank You, God, For Letting Me Run! Thanks for health and strength. I understand they are gifts, not rights. I promise, I will NEVER take them for granted! so strong and fierce in July. and for runs through glittering snow. and for air so cold that it prickles and stings. And thanks for the scent of rain. and for the Harpeth when it almost overflows its banks, vigorous and strong. sometimes wild and turbulent and violent and alive! Thank you for songbirds, colorful and sweet. Thank you for red-tailed hawks, somber and proud. Thank you for Blue Herons, elegant and majestic. and for music...of all sorts. because a run compelled me to be out of doors. Thank you for meeting me on runs. Running has been to me, and remains, a beautiful gift. I am truly blessed and profoundly grateful. Thank you, with all my heart!! Herein, an artist tells a story...simply, elegantly, beautifully. Glory given wings. Thank you, dear Iz, for sharing it with me. It's not like I've never fasted, you understand. I have, for a day or so, when I had to have a diabetes screening during pregnancy, or when I was a teenager and just forgot to eat. Sometimes I even fasted to pray. Although, quite frankly, those times have been few and far between. Orthodoxy has messed with my non-fasting tendencies. You see, whereas Protestants approach faith with a "once I understand something and can commit my mind and heart to it, then I will commit my body to it as well" mantra, Orthodox tend to live a practice in their bodies first and allow the mind and heart to catch up. Hence, if you would not be a slave to your appetites (and I'm not only talking food here), practice saying no to them. The Church is good to provide opportunity for this. Every Wednesday and Friday are "strict fast" days, meaning no meat, dairy, wine or oil. These days are set aside to help us remember the trial and crucifixion of Christ. Additionally there are two minor (read short-a couple of weeks) and two major (40 days'ish) fasts in the liturgical year. The specifics of each of these vary, with the Lenten fast being the most rigorous. The Advent fast, which began November 15th and will continue until Christmas Day, is a "kinder, gentler" fast with only Monday, Wednesday, and Friday being strict. Most other days wine, oil and fish are permitted, but no meat or dairy. There is no fast police. No one will interrogate you about your fasting practices. In fact, part of what we learn in the process is how to show grace to one another. But, as with all other practices of the faith, fasting has been provided us for our salvation. So I choose to submit. And, I should say, there is something marvelous about walking this practice out with my sisters and brothers. So, what has it meant to me to "keep the fast"? I have seen how slavishly I provide for my stomach. I find myself obsessing about certain foods in particular. I even dreamed about it two nights ago. In my dream I saw table after table laden with rich, decadent desserts. My mouth was watering. Alas, I woke up just before we were to eat. I was tormented! "I can't even have butter in my dreams!!" That is what I was thinking, if you want to know the truth. Most of the time, I feel "not quite full". Because I am at the peak of my training for a marathon (1 month away), I have been careful to get plenty of protein. But, even with that, my largely vegan diet tends to break down more quickly. This has actually been one of the more beautiful parts of the experience. Both Nativity and Lent are times of expectation, times of longing. To have a constant reminder in my body that something is missing, that something is not quite right, makes this more intense and more real. This weekend, the fasting moves to another level. On Sunday, Mike and I are being Chrismated (more about this in another post). We will receive the Eucharist for the first time. I can not even tell you what this means to me. But, Orthodox fast COMPLETELY before receiving the Body and Blood of Christ. It is a very beautiful and reverent practice. But I am a little nervous. I have never done a cleansing fast, but I am told that your bodily fluids become rank and you have an awful taste in your mouth as your body disposes of toxins that have accumulated. I would have to say that my experience with fasting has been similar on a spiritual level. I can't say that I am pleased with everything I have seen about myself. Some of it is rank and foul. But, until it is revealed, it can't be expelled. Until it dies, it can not live. Yesterday, I shared with you old friends of the family who bring delight to our family during the Christmas season. Today I would like to introduce you to two resources that are helping me prepare my heart for the coming of Messiah and are imparting a great deal of beauty and significance to this Advent season. Incarnation. It is a central component of all Christian theology. But, never have I encountered a people who revel in the Incarnation, who embrace it in all its wonder and mystery, as do my Orthodox brothers and sisters. Father Thomas Hopko is proving a winsome and able guide to my first Orthodox celebration of Advent with his lovely book, The Winter Pascha. There are 40 meditations about life and image, about vision and worship, about Mary and saints, about God With Us. He quotes Church Fathers as well as modern authors, and he shares Beautiful words from the Advent and Christmas Liturgies. It gives me a great deal to wrestle with as well as sweet places of reverie. If words were ornaments, they might be hung inside a book very like Watch For the Light. This is a delicious lyric celebration of all things mystic and magical. Forty-five selections by brilliant and diverse authors like Sylvia Plath, St. John Chrysostom, Henri Nouwen, Madeleine L'Engle, Bernard of Clairvaux, C.S. Lewis, Soren Kierkegard, T.S. Elliot, and Annie Dillard bring little pieces of radiance to each day. They explore fear, danger, and revolution. They probe the topics of light, miracle, and grace. They invite us to know the Mother of God, the magi, and the Blessed Bethlehem Babe. And they give us unexpected glimpses inside ourselves. If words were ornaments, hand-painted, delicate, compelling, they would look like this. We Wish You a Literary Christmas! "...He was dress in muskrat from his head to his foot an his clothes is all dirty wit' ashes an' soot. A sack full o' playt'ing he t'row on his back he look like a burglar an' dass fo' a fack. His eyes how dey shine his dimple how merry! Maybe he been drink de wine from blackberry.....An' I hear him shout loud as a splashin' he go Merry Christmas to all 'til I saw you some mo'." 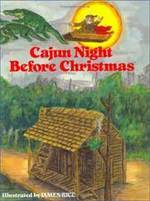 The Cajun Night Before Christmas is a lyrical delight. My aunt introduced this one to us a number of years ago when she and her family lived in New Orleans. We laugh at the clever colloquialisms and try to out-do one another with our accents. Incidentally, we also have The Hillbilly Night Afore Christmas and The Redneck Night Before Christmas, both of which come a little to close to my raising for my comfort. but are hysterical. "Every Who down in Whoville loved Christmas a lot, but the Grinch who lived just North of Whoville did NOT. The Grinch hated Christmas...the whole Christmas season. Now, please don't ask why. 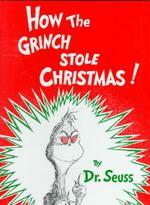 No one quite knows the reason..."
How the Grinch Stole Christmas is one of those deceptively simple stories. I say deceptive, because it is, at the same time, quite profound. It is about bitterness and loneliness, misunderstanding and revenge, discovery, understanding, forgiveness, and transcendence. Which of us does not find ourselves somewhere in the Grinch? Something amazingly restorative happens...something more than resolution or resolve.....healing. He encounters something beyond his ability to comprehend, and in the process his desire is changed. "And what happened then? Well, in Whoville they say that the Grinch's small heart grew two sizes that day." 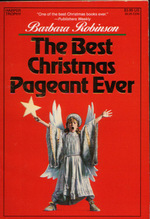 The Best Christmas Pageant Ever is a riotous adventure, alternating between hilarity and disarming truth. The characters are believable, if somewhat fantastic. We find ourselves viewing the Herdmans with a mixture of revoltion and sympathy. Then, just when we least expect it, we find that the very people who seemed farthest from the essence of the Christmas story may, in fact, have experienced it at its deepest level. I defy you to read it without tears. "It was late on a bitterly cold New Year's Eve. The snow was falling. 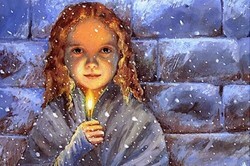 A poor little girl was wandering in the dark cold streets, she was bareheaded and barefoot..."
Hans Christian Anderson's compelling story of The Little Match Girl helps me remember that there are people who will walk through the holidays with heavy hearts and empty stomachs. It helps me remember that if I will open my eyes to see them, they are all around me. And...I might be the very one who is meant to help. I read it for the beautiful language. I read it for Dickens' remarkable insight into the human spirit. I read it because it asks me questions I am afraid to ask myself. I read it because it is a story of hope. A Christmas Carol. A Christmas classic. Not an exhaustive list, obviously. But a few favorites. Merry Literary Christmas!